Keynote makes slide creation easy and — believe it or not — fun! This MacBook application was designed by Steve Jobs and used for his Macworld keynotes every year, and there’s so much visual candy available that you’ll never need to shout to wake your audience again. The Template Chooser window appears. Click the Slide Size pop-up menu at the bottom of the screen to select the resolution for your completed slides. Although you don’t necessarily need to select an exact match for your laptop’s screen resolution, it’s a good idea to select the closest value to the maximum resolution of your projector. (If someone else is providing the projector, the default value of 1024 x 768 is a good standard to use.) If you’re using a second monitor during your presentation, select the native resolution for that monitor instead. Click the desired drive in the Devices list at the left of the dialog, and then click to drill down through folders and subfolders until you’ve located the Keynote project. You can also use the Search box at the top of the Open dialog to locate the document by name or by some of the text it contains, or click the All my Files location in the Open dialog sidebar to display your documents. Click the Where pop-up menu and then choose a location to save the document. To select a location not on the Where pop-up menu (such as a specific folder on your drive), choose the volume or drive on the Where menu, and then click the button with the down arrow symbol to expand the sheet. You can also create a new folder from the expanded sheet. After you save a Keynote presentation for the first time, you can create a version of that document by choosing File→Save a Version. To revert the current presentation to an older version, choose File→Revert to Saved. 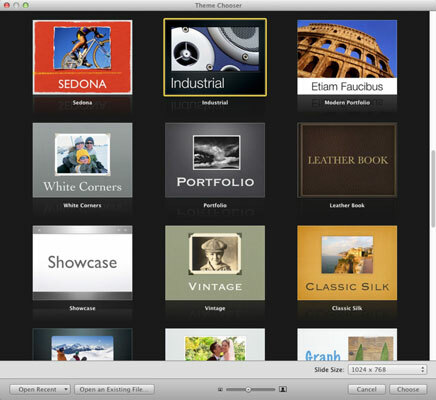 Keynote gives you the option of reverting to the last saved version, or you can click Older Version to browse multiple versions of the presentation and choose one to revert to.